He was too funny while taking the pics! The looks I can shut my eyes and see him looking at me with the disgusted look on his face!!! 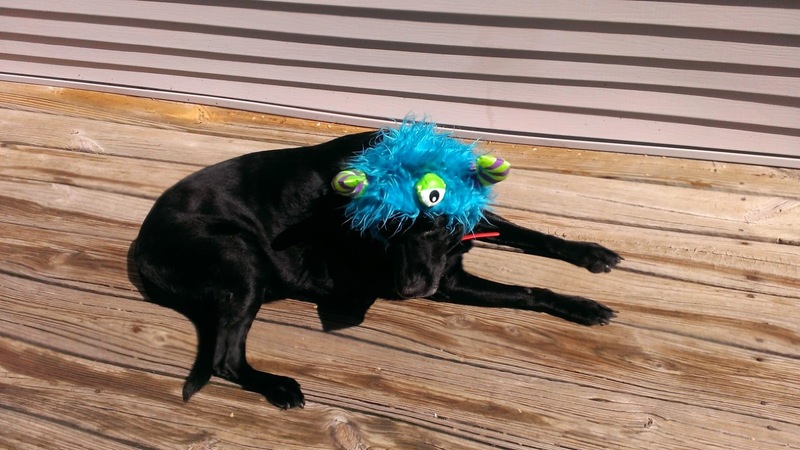 When Wholesale Halloween Dog Costumes asked me to review a costume for Kingers I was like sure! I love Halloween...King not so much. Every year I dress him up. I swear that dog knows what is about to happen when the costumes arrive in the mail. He gives me the look of "REALLY"..today was no different. 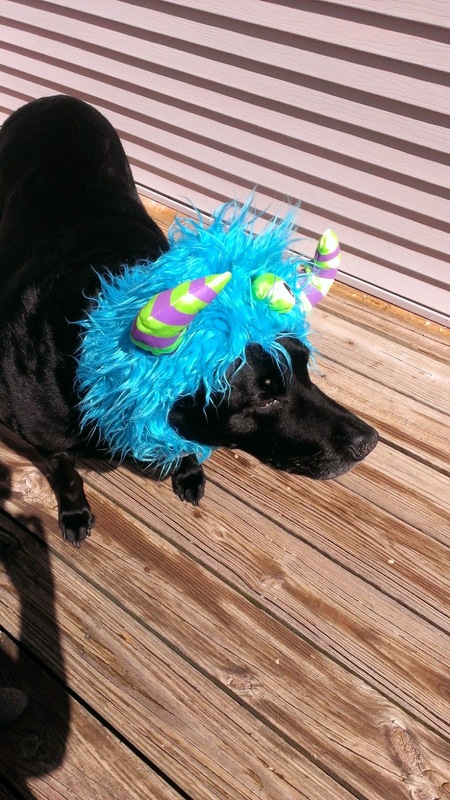 For Halloween this year Kingers is going to be the dog that looks like Sulley. Kingers is 100 pounds so many costumes do not fit him. The Monster Hoodie is perfect! He gets in the Halloween mood without having to wear a complete costume! Plus, it is super easy to put on. The hoodie has velcro at the base so the hoodie is very very easy to put on Kingers head. No stress or drama from getting dressed up! For the last few years I have been getting costumes through the mail from Wholesale Halloween Costumes. They have such great costumes at very reasonable prices. All three kids and Kingers always get a new costume each year. Wholesale Halloween Costumes makes that a option for me because they carry so many costumes at a great prices. The Monster Hoodie is only $11.90 - there is no way I could even think to pick him up a costume at a pet store for that price. I was really thinking about making him Batman this year! I figured Kingers would prefer the hoodie. GOSH he is cute! He hates looking at the camera! 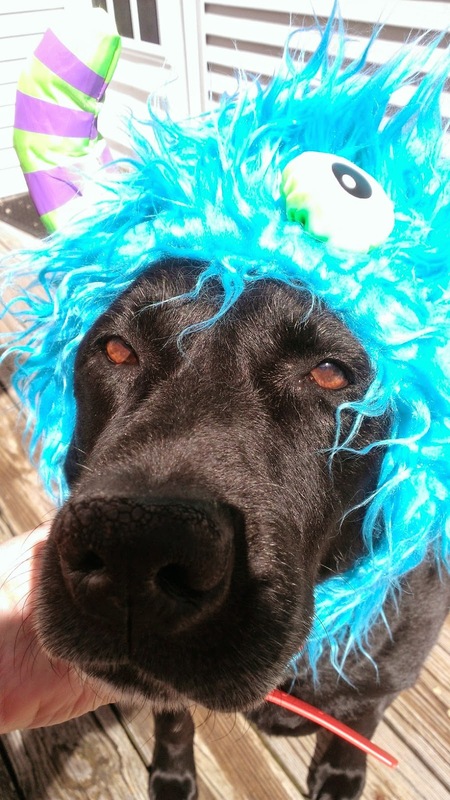 Remember Wholesale Halloween Costumes is a great place for all costumes - Adults - Kids - Babies and of course your Pets! Order Early while the selection is so good. Closer to Halloween your favorite costume might be sold out! So now you know why I always purchase Kingers and the Kids Halloween Costumes in June...the costume selection is fantastic in June and the prices are amazing. Make sure to check out their clearance section!